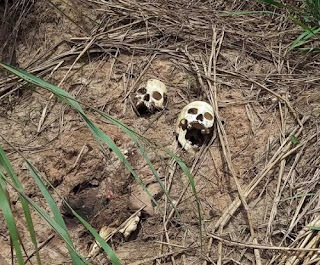 A court of magistrates in Ilorin, Kwara state, has been informed about how a cleric and founder of St. Moses Orimolade Cherubim and Seraphim Church, Gabriel Josiah, exhumed more than 200 human skulls from the Muslim cemetery in the Osere area of ​​the capital of the state in seven years. A police witness, Peter Ibiyemi, gave details earlier this week in his testimony at the resumption of the hearing of the case, which began in 2016 when Josiah, popularly called Eli-Wakuku, was arrested and prosecuted. Ibiyemi, an investigative police officer (IPO) who was led in evidence by a state prosecutor, Muhammad Akande, told the court that the defendant allegedly made the confession in a statement obtained from him. The IPO also explained that the defendant, according to his statement, started the "business" in 2009 and so far had exhumed 200 human skulls from the Muslim cemetery. He further stated that the defendant confessed to having perpetrated the act mainly at night, and bluntly added that he allegedly paid the sum of 10,000 N10 to the security man in the cemetery for each operation, while allegedly confessing to having sold the skulls for N6, 000 each one to a native doctor, a Gabriel Moyosore. However, during the interrogation, the defendant's lawyer, Taye Olojoku, argued that the statement obtained from his client was not voluntary. The legal practitioner, who claimed to have witnessed the torture of the defendant by the police, added that his client gave the statement under duress. The defendant had been accused before the Court in 2016 together with one Gabriel Moyosore and Yinusa Sa'ad Ayinla for alleged criminal conspiracy, illegal entry and illegal possession of human heads, contrary to articles 97.348.219 of the criminal code law. It was said that a fourth defendant, identified as Alfa Alaba Isiaka, was a fugitive. The police prosecutor, Sergeant A. Seye, made a first hearing in the court chaired by magistrate (madam) KA Yahaya that the information that led to the arrest of the defendant was received on February 5, 2016, but that the defendant I had been at work since 2009. Part of the First Information Report (FIR) of the police on the case reads as follows: "that you Gabriel Josaya, alias Eli-wakuku, the prophet and founder of Saint Moses Orimolade Cherubim and Seraphín Osere Church area Ilorin conspired with you Gabriel Moyosore 'm,' Yinusa Sa'ad Ayinla, Alfa Alaba Isiaka (in general) and others used illegally to enter the Muslim cemetery, in the Osere Ilorin area, since 2009 to the date where some human skulls have been eliminated by you and sold to your various customers at the rate of eight thousand naira (N8,000.00) per skull. "You also use it for money rituals and other evil acts. You got involved in other nefarious activities within the area of ​​Osere, Ilorin and its surroundings at night. "The police investigation revealed that Gabriel Josaya really conspired with other suspects and sold the last human skull to Gabriel Moyosore at the rate of N6, 000.00 in which said human skull was discovered in the possession of Gabriel Moyosore and you confessed to committing the crime. that way you committed the previous offenses. " During the initial proceedings, Gabriel Moyosore however told the court that the first accused in the case, Pastor Gabriel Josiah, gave him the head of a chimpanzee, and not that of a human being, for the treatment of his sick brother. . Moyosore made the statement while testifying at the resumption of the trial at the trial, as he denied possession of human skulls during the interrogation of his lawyer, Muhammed Aminu. According to him, the brother of the first defendant who suffered a stroke was brought to him as an herbalist for the traditional treatment and one of the ingredients of the medicine was the head of a chimpanzee, who asked him to provide it. According to him, the first defendant brought the chimpanzee's dry head and was surprised that the police arrested him for being in possession of a supposed human skull. Moyosore told the court that he could not differentiate between the human skull and the skull of the chimpanzee, especially the dry ones, because they resemble each other. He also told the court that his confessional statement had been taken under duress and that it was made in the Police Division A "not at the Police Headquarters, and stressed that he could not write and that the statement was written by the police to him. Previously, the first person accused, Pastor Isaiah, during his own cross-examination told the court that the accusation against him was not true. He told the court that he was involved in the case by a friend with whom he had a car deal, but that he broke down and later went on to accuse him of possessing human heads against him with the police. The Magistrate, Kehinde Yahayah, adjourned the case till August 15, 2016, for ruling on adoption of final addresses. However the case was later transferred to Magistrate Muhammed Ibrahim on the same count in 2018 where the matter came up for hearing on Tuesday. The new magistrate has adjourned the case to July 5, 2018, for a fresh trial –within- trial.